petition: Don't Swipe Right On Dating Apps That Allow Elephant Cruelty! Don't Swipe Right On Dating Apps That Allow Elephant Cruelty! When animal lovers are looking for love on a dating app, it makes sense that they may pause at cute pictures of people with animals. 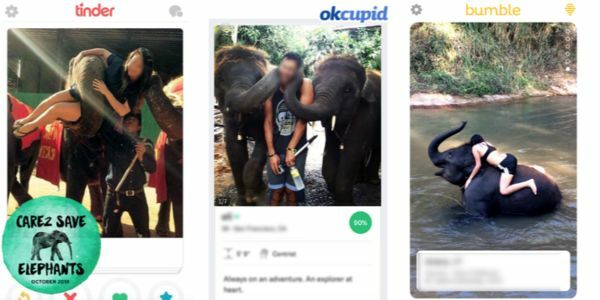 But if you see a selfie with a baby elephant or a pic of someone riding an elephant — you should definitely NOT swipe right. If you you see someone riding, hugging, and posing with a wild animal like an elephant on Tinder, Bumble, or OkCupid ... watch out. While these photos may seem cute, the sad truth is that it's very likely that animal has been abused. The only way to train an elephant to perform tricks, "pose" for photos, or carry people on its back is to physically hurt them. The "crush" method, used to train elephants to give rides, involves isolating, chaining, and abusing the elephants until their spirits are broken. After that, they are controlled with fear and pain. The elephant's brutal abuse and suffering is not apparent in the smiling vacation pic or cute elephant selfie you post on a dating app — but it's there. That's why Care2 is calling on dating apps like Tinder, Bumble, and OkCupid to take a stand and ban captive elephant or elephant tourism photos. Sign and share to tell Tinder, Bumble, and OkCupid to BAN photos of cruel elephant tourism — any pics of riding, "hugging," or forced posing of captive elephants. When Tinder, Bumble and OkCupid allow these these photos on their sites, they are helping to glamorize the brutal elephant tourism industry. There are around 3,000 captive elephants enslaved in tourism in Asia — and this number is growing. According to World Animal Protection, there has been a 30% increase in the number of captive elephants in Thailand in the last 5-years alone. If enough animal lovers speak out, we know we can convince these companies to do the right thing. Over 150,000 Care2 members convinced Lonely Planet, the largest travel guide book publisher in the world, to stop promoting elephant "ride" and other captive experiences that cause major suffering and abuse. And — in 2017, PETA called on Tinder to remove "tiger selfies" citing the physical abuse, forced drugging, and other cruel method used in these captive tiger experiences. Please sign and share the petition calling on Tinder, Bumble, and OkCupid to stop idealizing the cruel elephant tourism industry and BAN any photos that depict riding, "hugging," or forced posing of captive elephants.